I primarly work as a guitarist & bassist for bands & projects across the UK. With many years of experience, I’ve learnt 100s of songs, and able to perform the majority of them at any given time. I’ve performed with many functions bands across the UK, including my own bands I run which are Discovered & The Kicktones. I have performed with various music services, theatre productions & acts such as Rockoke. Below are some of the highlights of who I’ve worked with. Female fronted band with over 400 gigs played across the UK. The band has performed events for Google, Vodafone, BMW, RAF, NHS plus many weddings & parties. 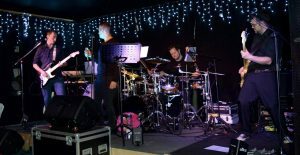 Functions band in Surrey, performing classic 60s Motown, 70s Discos, 80s pop & modern hits. A brand new exciting tribute act to 90s Britpop, launching 2018. In the early stages of learning guitar, I learnt how to play classical guitar, studying grades. Below is a playlist of songs I’ve arranged as fingerstyle covers.